This is a broad area of discussion. What is worth a place in oneâ€™s collection is very much determined by the personâ€™s taste and on the approach he might have towards collecting music. There are thousands of thousands Heavy Metal CDs out thereâ€¦ so what makes some of them more collectible or more rare than others? Here is a guide of several different collectible types of CDs. These are releases from the band themselves. Usually on a small print range that could be anything from 100 to 2500 copies. New and upcoming bands will put their own cash together and will press their own album that will spread to friends or will sell at gigs or via their website. By definition most of these private releases are collectible because you will not find them in the normal music distribution channels. It will require some research from your side and if the band is really good all the copies will be sold quite quickly. Throughout Metal history there have been cases where a band with a private release would sign to a big label thus getting more publicity and exposure resulting to more demand for that original self-released copy which in turn will gain more value within the collectorsâ€™ community. Promotional CDs are tools for the record labels to spread the word about a release in the media (magazines, radios, websites) and in other individuals involved in the music business (DJs, promoters, festival organizers, venues, stores etc). As already been mentioned elsewhere in this site promos are never available to the public. They are pressed on limited quantities (500 â€“ 2000 or maybe more - depending on the promotional plan of the label) always with a "not for saleâ€ stamp on them. Promos are different from the normal CD release in a number of ways: Their packaging is usually paper cardboard sleeve or slim jewelcase. There is always a biography and discography of the band plus other information bits (often referred as â€˜selling pointsâ€™) that highlight the strengths of the band and are useful to music professionals and journalists. On promos you will also find business information like the distribution network of the label or contacts of gig organizers. Some labels also include a multimedia section on their promos with high resolution logos and photos of the band, biography and other relevant material. One more reason that promotional CDs are collectible is the fact that they are never re-pressed! Labels print an amount of promos they will need and thatâ€™s it! For any label the promo CD has a short period of life. It is useful only to spread the word for a couple of months prior to the official release date. Even if they run out and they need a few more they will not press additional copies. Instead, they will use the normal album release. In music terms a promo CD is most of the times the same as the normal album release but occasionally a label might include one or two extra cuts like a radio edit or a bonus track. Some collectors are really fanatic about collecting promos. Also there have been cases of promotional CDs in ridiculously limited numbers (10 to 50 copies) that were pressed to serve specific promotional targets like top US college radios or South American TV shows. Not to mention how expensive these CDs have become (if you ever find them). The only places you will find promotional CDs are second-hand and on-line stores. In an effort to capitalize on the die hard fans, record labels often release a different limited edition CD of a given album. Limited edition CDs offer something extra: This could be extra packaging (e.g digipack), extra tracks, extra CD or extra DVD. Often limited editions are numbered by hand or by a mechanical stamp. Since the mid 1990â€™s, many magazines from around the world are offering extra stuff to attract more buyers. 97% of the time this extra stuff is a CD. And most of the times this CD is a compilation made up with tracks from current releases by well known bands and by newcomers. Arguably these compilations can not be considered as collectible (or at least very collectible). However, there have been cases of magazines that released some amazing CDs that are really very hard to find! 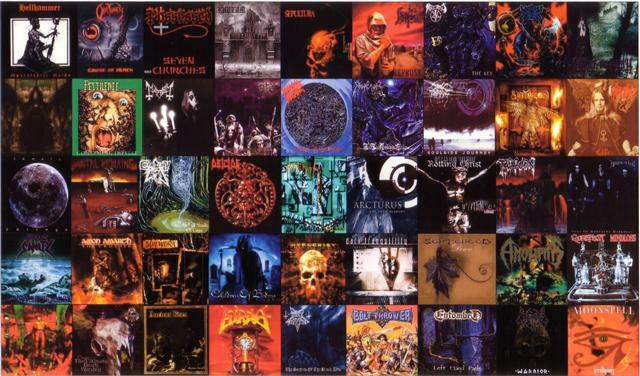 The Greek magazine Metal Invader released a number of such CDs in the mid to late 1990â€™s. These include â€˜The Official Demo Seriesâ€™, a series of seven CDs, where several rare material was officially released under license. The first CD included demos of Infernal Majesty, Dark Tranquility and Dark AngelDreams Of Eschaton â€“ demo 1981â€™ by Manilla Road, â€˜Outrageous Fourtunesâ€™ by Skyclad, â€˜The Beloveds Cryâ€™ by Orphaned Land and the â€˜1987 demoâ€™ of the cult Greek epic metal band Sarissa. These kind of magazine CDs were circulated in kiosks and newsagents and were available for a limited time, basically until the next issue hits the road. They were never released via the normal distribution channels and they were never available outside the borders of their country. The only places you can find them are in second hand stores and on ebay. A more detailed article on valuable magazine freebie CDs from different countries will be coming up soon. The last few years the Metal community saw the emerge of many new small size independent labels that are specializing in re-releasing older material. Most of this material is usually either unreleased â€˜lost and foundâ€™ or stuff that has been released in the past in very limited numbers with no major distribution. These re-releases most of the times are of higher quality, offering booklets that are rich in information and pictures. The print run is generally small (in between 500 â€“ 2000 copies) something that makes them soon very collectible. Of course the most important part is the music itself and the fact that this music is preserved and made available for the current and future generations.